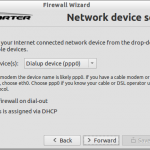 Firestarter is an easy to install firewall application for Ubuntu which also has to the option to enable Internet Connection Sharing at the click of a mouse. Launch the application firestarter. The wizard will come up on the first run.